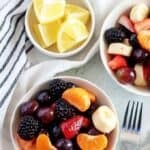 A delightful and sweet homemade fruit salad recipe featuring all of your favorite fruits, like strawberries and blueberries tossed in a simple lemon syrup. Spring is finally making an appearance here in Northwest Arkansas. Complete with plenty of rain and warmer temperatures. You know what that means, right? Spring and Summer focused recipes are on their way. 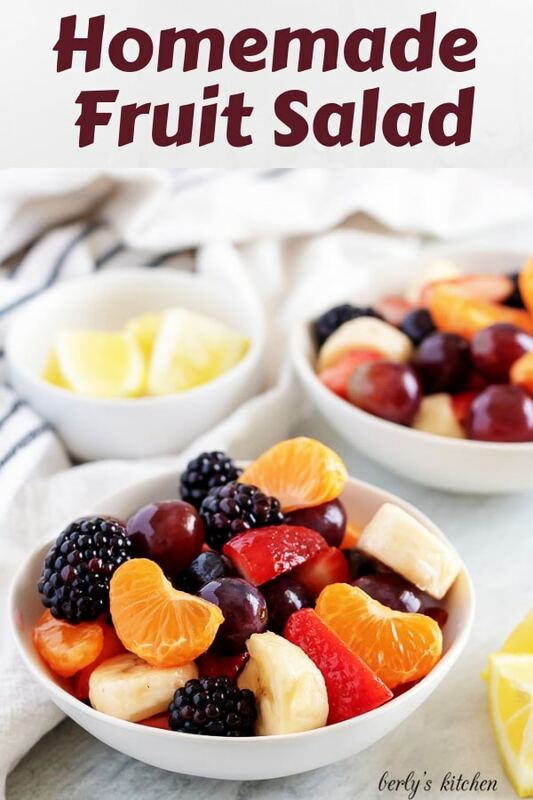 For today, Kim and I wanted to share our homemade fruit salad recipe. It’s so easy to prepare and has a tart, yet sweet, simple syrup. 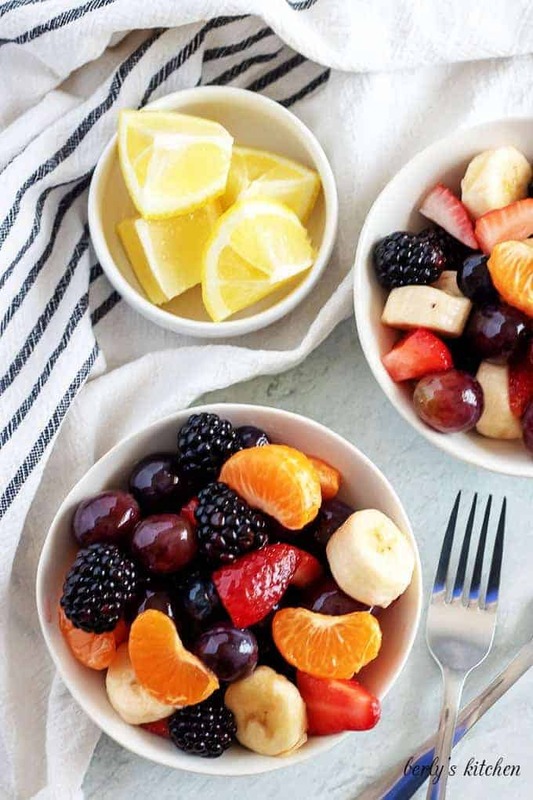 As you’ll see from the photos, there’s not a whole lot to preparing this fruit salad. The longest part is waiting for the lemon flavored dressing to cool. But, I recommend starting with it, so there’s ample chilling time, while you prep the fruit. So, without further adieu, let’s get started! To begin, grab a small saucepan and pour in a half (1/2) cup of water. Then, add a half (1/2) cup of sugar to the pan. Now, I know that seems like a lot of sugar, and it is quite a bit. With that being said, it’s still early for, “berry season,” so, I had to add an appropriate amount of sugar to counter the tartness of the fruit. I’ll talk about how to determine the correct amount of sugar in the tips below. 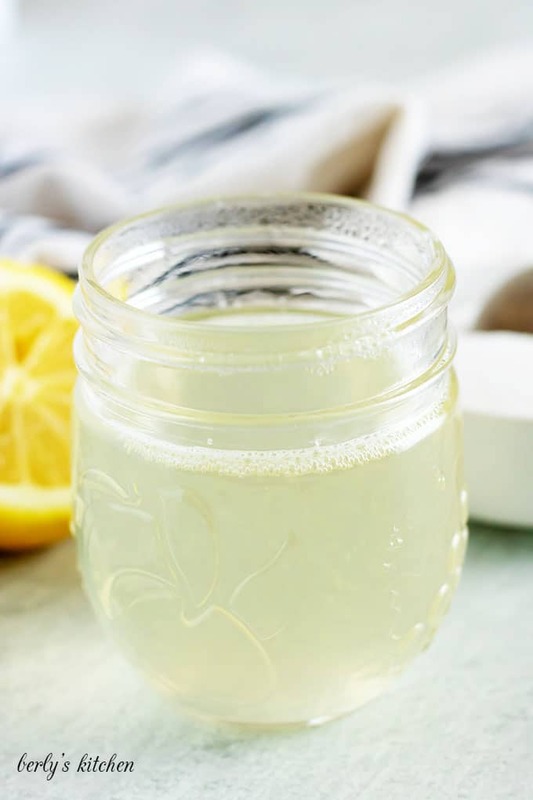 Once you have the sugar and water in the saucepan, you’ll need about two (2) tablespoons of fresh squeezed lemon juice. That’s right, fresh lemon juice. Not the extract stuff, because, you need that acid to keep the fruit looking fresh. Heat the syrup over medium heat for three to four (3 to 4) minutes or just long enough to dissolve the sugar. When the sugar has completely mixed with the lemon juice and water, remove the pan from the stove-top and set it in your fridge to chill. Probably not a good idea to pour hot syrup or sauces over fresh fruit. In the tips below, I’ll offer a suggestion on how to make this syrup without using a pan. Okay, while your syrup chills, you can begin prepping your fruit for the salad. What goes into a fruit salad recipe, you ask? In my humble opinion, any darn fruit you want. However, the proper answer is, fruit that compliments each other. But, what does that mean? It means choose fruit that works well together, in regards to flavor. We seem to be chasing our tails here. Instead, I say, pick fruit you enjoy and don’t worry about it. We chose, bananas, blackberries, blueberries, grapes, Mandarin oranges (or Cuties), and strawberries. Mainly because, we like them, and what better reason do you need. 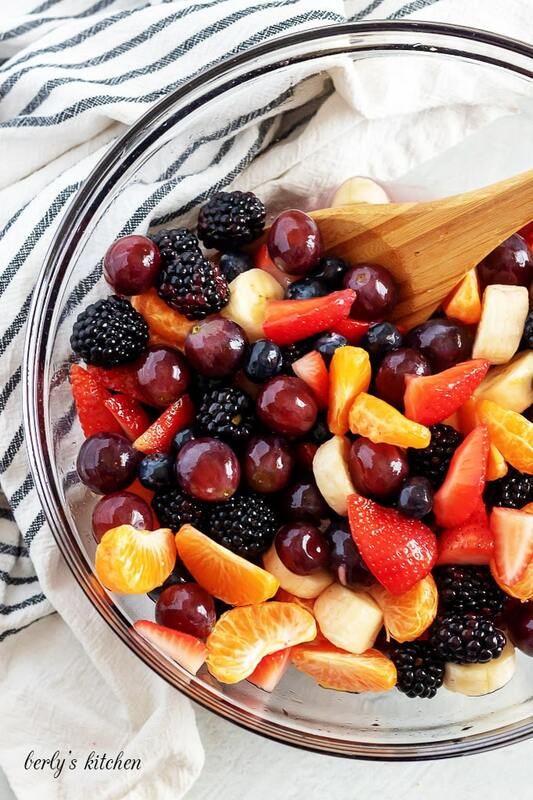 At this point, all of your fruit should be prepped. Place everything into a large glass mixing bowl. The lemon syrup for your homemade fruit salad should be cool enough to use. Simply, pour the syrup over your fruit and use a spatula, or wooden spoon, to give everything a good toss. Believe it or not, your homemade fruit salad recipe is pretty much done. See, I told you it was an easy fruit salad recipe. All that’s left to do is serve it or place it in a sealed container, in your fridge. My dish usually only lasts about three (3) days. You might know some way to make it last longer, but I don’t. Kim and I hope you enjoy our recipe and wish you all the best! 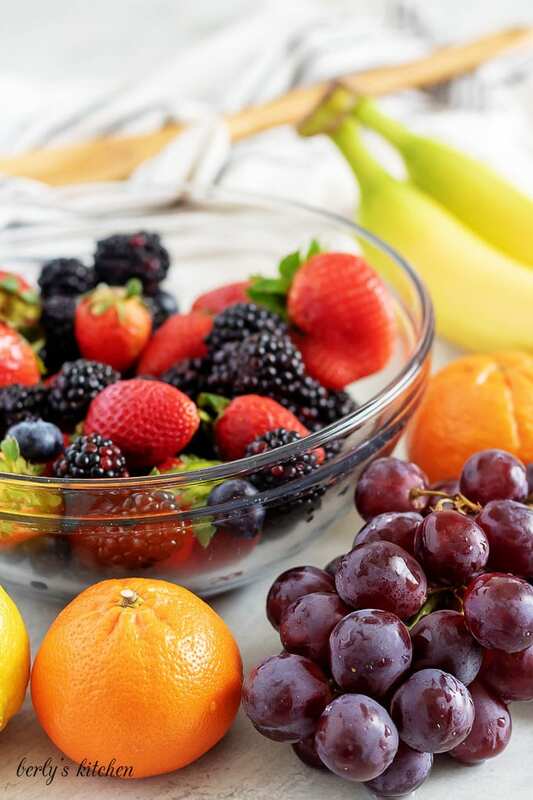 Determining the right amount of sugar for your fruit salad is as easy as taste testing the fruit. Seriously, that’s all you need to do. If the berries are naturally sweet, then reduce the amount of sugar from a half (1/2) cup to a third (1/3) of cup. On the other hand, if they’re bitter, then increase the sugar a fourth (1/4) cup at a time to reach your desired level of sweetness. On the chance that you have a good water heater, you can make the simple syrup without dirtying a single pan. Meaning, if your tap water can dissolve sugar, then you’re good to go. Grab a seal-able container, add the hot tap water, sugar, and lemon juice. Give it a good shake to mix everything and chill it in your fridge. Lemons aren’t your thing. That’s not a problem. Try using lime juice or orange juice (all fresh squeezed) in the simple syrup. By the way, I use similar syrup recipes for most of my cocktails. No sense buying something I can make at home at a fraction of the cost. Craving Salads? We got you covered! If you enjoyed our homemade fruit salad recipe, please leave us a comment and rate the recipe card. 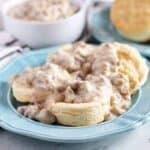 You can also find us on Facebook, Pinterest, Twitter, and Instagram by searching for Berly’s Kitchen! In a small saucepan, over medium heat, combine the water, sugar, and lemon juice. Let simmer for two (2) to three (3) minutes or until the sugar has dissolved. Remove the pan from the heat and store the syrup in your fridge to chill while you prep the fruit. Wash and dry all of the berries and the grapes. Slice the strawberries, peel and section your oranges, and peel and slice the bananas. In short, prep the fruit. 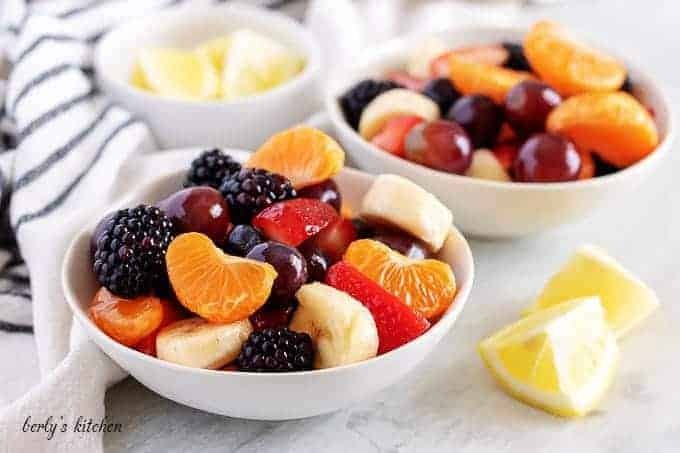 Combine all of the fruit into a large mixing bowl. Pour the lemon flavored simple syrup over the fruit and use a wooden spatula to gently toss the everything together. Be sure to get as much syrup on the fruit as possible. 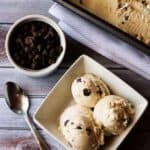 Serve immediately or store in your fridge for up to three (3) days. The calories listed are an approximation based on the ingredients and serving size of a half to three-fourths (1/2 to 3/4) cup of fruit salad. Actual calories will vary. 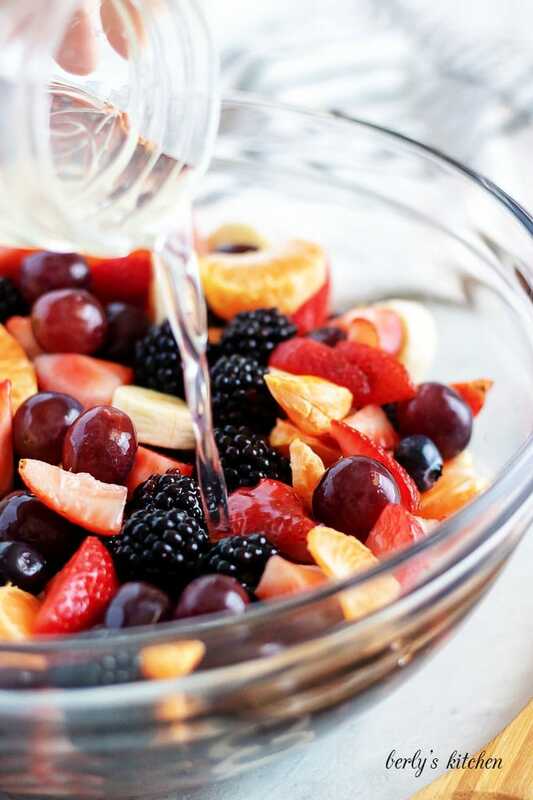 The homemade fruit salad can be stored in your fridge in a sealed container for up to three (3) days.